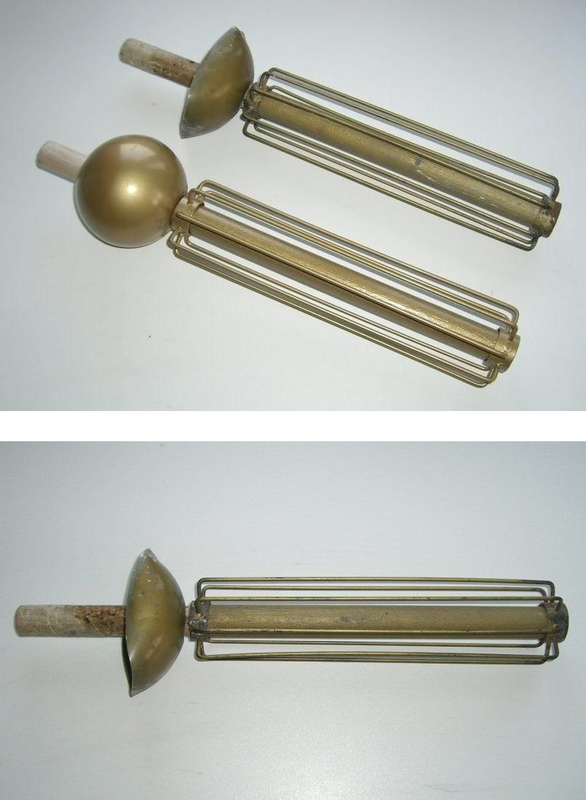 On eBay recently I’ve spied a couple of Dalek and Cybermen body parts! 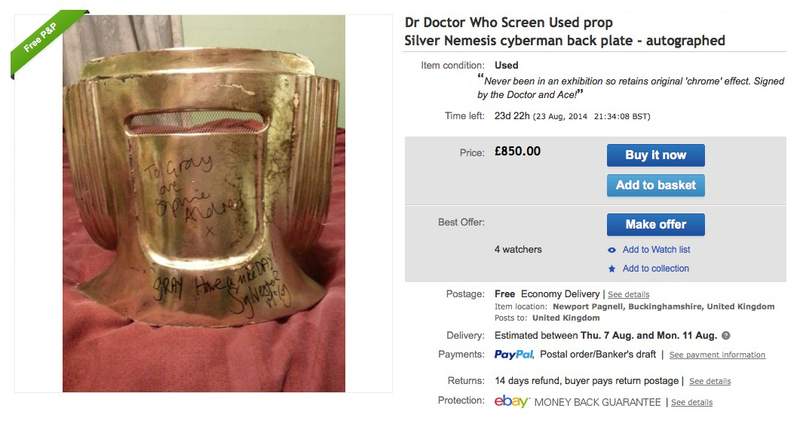 RARE OPPORTUNITY TO PURCHASE AN ORIGINAL SCREEN USED PIECE OF DOCTOR WHO LEGEND!! 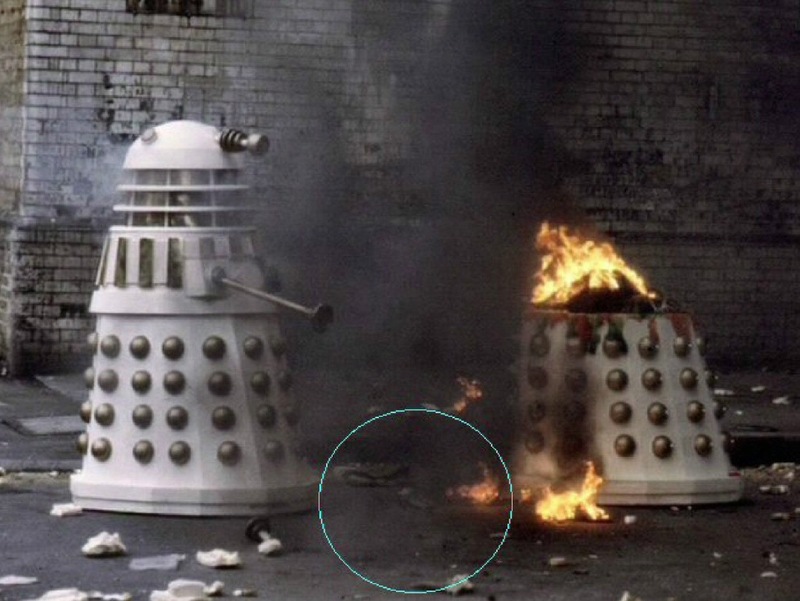 THIS DALEK GUN WAS USED IN THE 1988 SYLVESTER MCCOY STORY REMEMBRANCE OF THE DALEKS AND WAS PART OF THE SECOND IMPERIAL DALEK TO BE DESTROYED IN THE CLIMACTIC BATTLE SCENES BETWEEN THE IMPERIAL AND RENEGADE DALEKS. 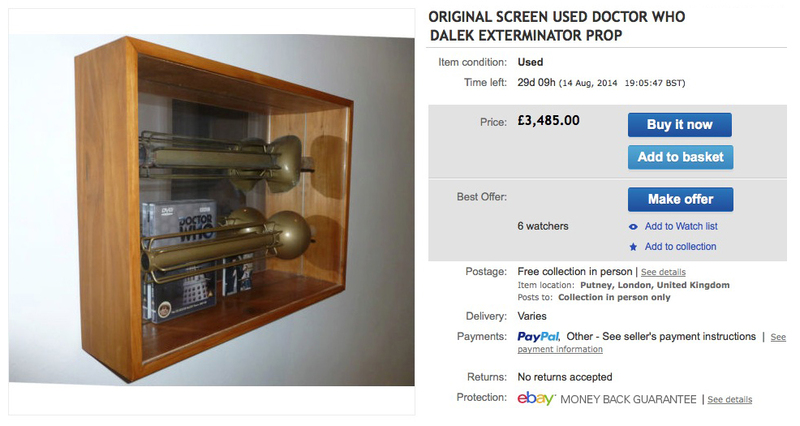 IT WAS AUCTIONED BY DOCTOR WHO PRODUCER, JOHN NATHAN-TURNER AND THE DOCTOR WHO APPRECIATION SOCIETY IN 1989 DURING THE "A DAY AT THE FORUM" CONVENTION. THIS WAS HELD AT THE SCHOOL USED FOR LOCATION FILMING OF REMEMBRANCE OF THE DALEKS IN HAMMERSMITH, LONDON IN MARCH OF THAT YEAR. 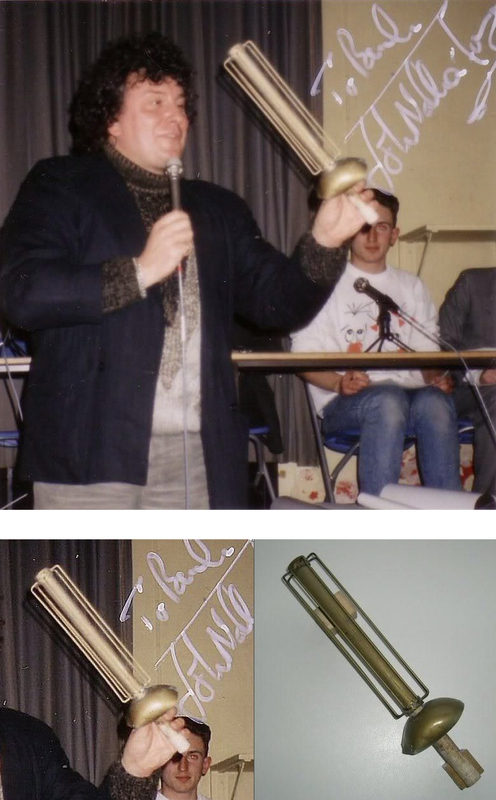 THE PHOTOGRAPH INCLUDED SHOWS JOHN NATHAN-TURNER AUCTIONING THE ACTUAL GUN AS PROOF OF AUTHENTICITY. THE PHOTOGRAPH IS ALSO SIGNED BY JNT HIMSELF. 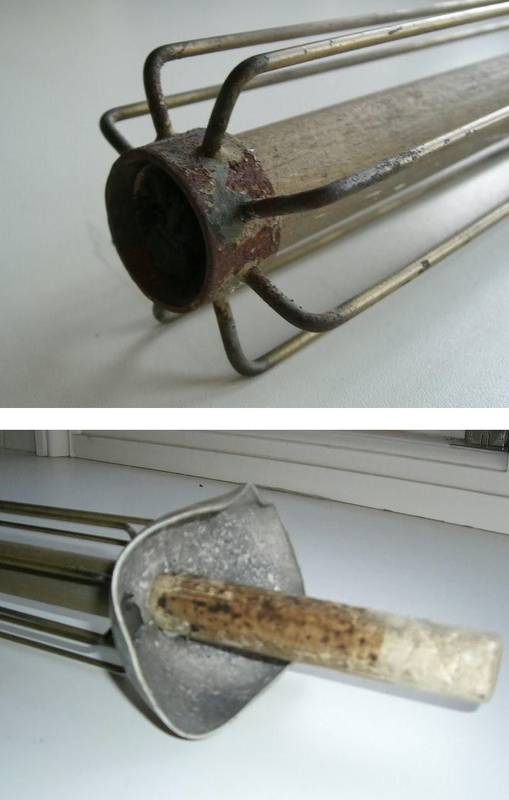 THERE IS ALSO A COMPARISON SHOT SHOWING THE GUN THEN AND NOW. THE SALE INCLUDES THE DISPLAY CABINET, SIGNED PHOTOGRAPH OF JNT AND THE REPLICA GUN WHICH I MADE TO SHOW HOW IT WOULD HAVE LOOKED ORIGINALLY - NAMELY BEFORE IT WAS BLOWN UP! I'LL ALSO INCLUDE THE EARLIER RELEASE COPY OF REMEMBRANCE THAT HAS THE DALEK (SANS GUN!) ON THE COVER. 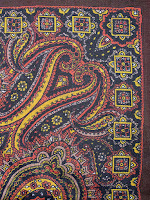 THE REPLICA IS MADE FROM THE SAME MATERIALS AS THE ORIGINAL AND TO THE EXACT DIMENSIONS. 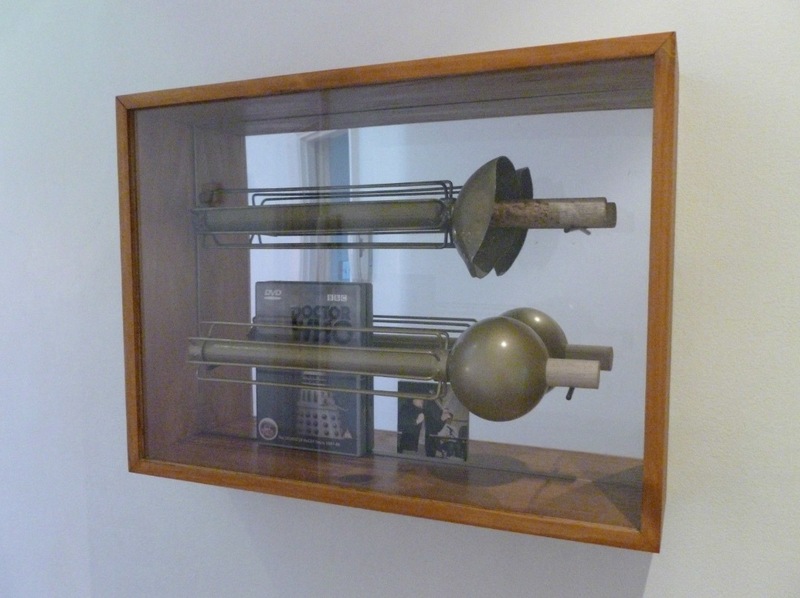 DON'T MISS YOUR CHANCE TO OWN THIS GENUINE AND INSTANTLY RECOGNISABLE PIECE OF DOCTOR WHO HISTORY!! 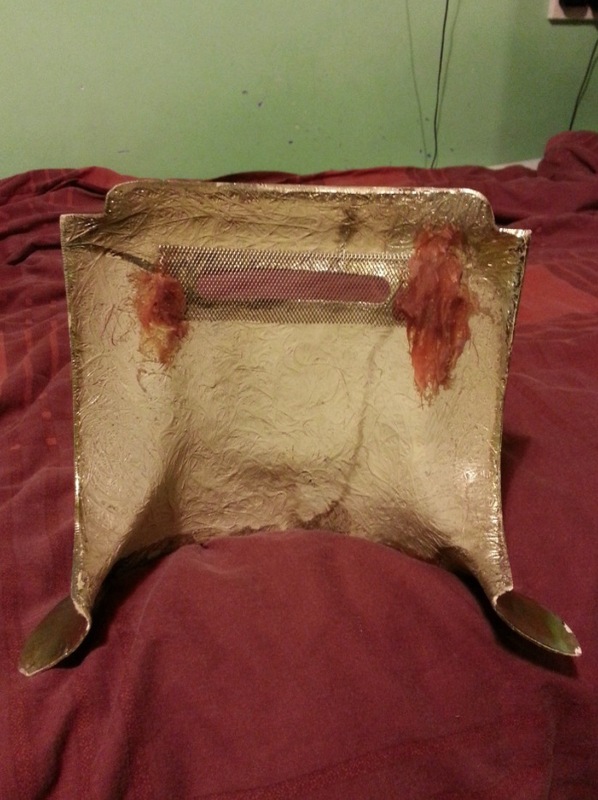 Original screen used prop from Silver Nemesis - the back plate of a Cyber helmet. This is unusual on two counts - It was presented to a member of the crew and has been signed by Svlvester McCoy (The Doctor) and Sophie Aldred (Ace). As such, it retains it's original chrome finish and has not been re-sprayed silver, as many of the Silver Nemesis props have been when used for exhibitions and even during filming, when the chrome reacted to the light and turned gold. 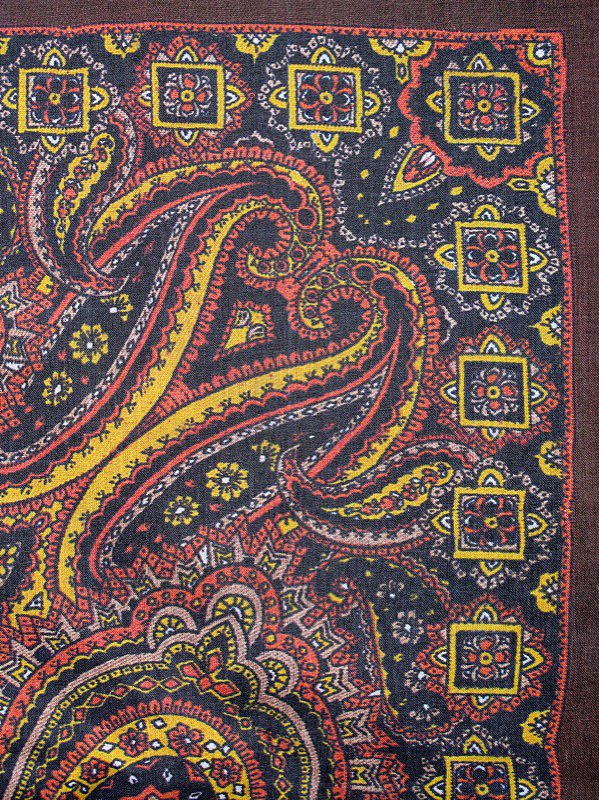 A rare prop, and even rarer in it's original finish. If you have any questions, please drop me a message, although due to work commitments I may not be able to reply straight away. UK only please - Note that this is for the backplate only, NOT a complete helmet.